In case you missed it the first time, tonight at 7 p.m. EST the SyFy channel will be re-broadcasting its natural disaster epic Sharknado. Last week's premiere of the movie - about a freak hurricane spawning off the coast of California and hitting Los Angeles, dropping shark-spewing tornadoes all over the place - became one of the biggest television hits of the summer. And then there's this, which is certainly destined to become the centerpiece of every home entertainment library it finds itself ensconced upon: The Power Rangers Legacy: The First 20 Years DVD collection. Just in time for the twentieth anniversary of the Mighty Moron... errrr, I mean Mighty Morphin' Power Rangers show which first unleashed this plague upon the land, Saban and Shout! 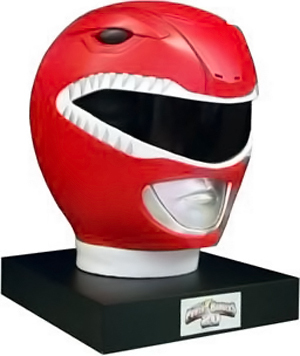 Media are unleashing "this limited edition home entertainment collection comes packed with every Power Rangers episode, from Mighty Morphin Power Rangers to Power Rangers Megaforce, boasting over 270 hours of action-packed entertainment across 98 DVDs". Tip o' the hat to good friend of this blog Drew Robert McOmber for alerting us to this... whatever.